Because there's more to CES than smart toothbrushes and Wi-Fi-enabled refrigerators. 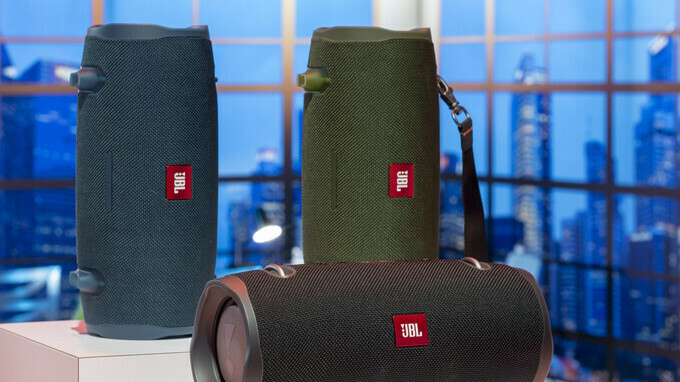 At this year's electronics show in Vegas, JBL refreshed its Bluetooth speaker lineup by introducing three new models: the JBL Xtreme 2, the JBL Clip 3, and the JBL GO 2. Names sound familiar? Well, that's because all models build on top of existing ones, bringing improved sound and, most notably, some serious water resistance. In fact, all three are IPX7 certified, meaning they can withstand a 30-minute dunk in 3.3 feet of water. The JBL Xtreme 2 is the most exciting speaker among the bunch. It is the biggest one too and it even comes with a carrying strap, paying tribute to the ghetto blasters of the '80s. It lasts up to 15 hours per charge, it has a USB port that can charge other gadgets, and it supports JBL Connect+ technology, allowing multiple speakers to play from the same source. Large passive radiators at the sides enhance bass frequencies. The JBL Clip 3 is much more compact in size. Made with adventurers in mind, the speaker has a rugged, rubberized exterior, and its built-in carabiner lets you hook it up to the side of a backpack or the roof of your tent. Its battery can last up to 10 hours between charges. And for buyers on a budget there's the JBL GO 2. It is available in 10 different colors, it is rated for 5 hours of playback per charge, and best of all, it is super affordable. Speaking of pricing, the JBL Xtreme 2 will cost you $300, while the JBL Clip 3 and JBL GO 2 will retail for $60 and $40 respectively. All three are scheduled to launch this spring. Does any of them support Bluetooth 5?